How to get dog pee and urine smells out of carpet: our tips! 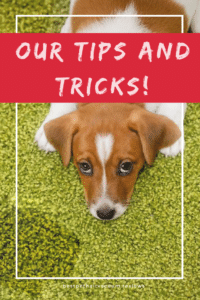 How to get dog pee and residual urine smells out of carpet: our tips and tricks! As much as we’d love to believe that the perfect training regimen and careful attentiveness on our part as owners will prevent accidents, they happen! If you have dogs, you can safely assume that they’ll pee on your carpets at some point in their life. It’s not the end of the world, though! While dog urine can leave nasty stains and persistent odor, it doesn’t have to. Below, we’ve compiled an assortment of our team’s top tips for getting rid of both visual blemishes and pungent odors from doggy pee. The absolute best thing you can do for any pee spot is to deal with it right away. Of course, if an accident happens while you’re out of the house, there’s not much you can do until you get home. But as soon as you notice an accident, spring into action! The longer it sits, the more work it’ll be to remove. The first step is to take up an liquid pee that’s still in the carpet. Anything that hasn’t dried already ought to come out before it has a chance to sink in and dry on carpet fibers. Use a shop vac if you have one, especially if it’s a big pee spot. Don’t try and vacuum this or any liquid with a normal household vac, though! Paper towels are also a good alternative. Use plenty of them, and once you’ve got a thick stack set up, step on them to make sure you absorb everything right to the base of the carpet. It’s better to do a few dabs before doing this, so you don’t get any on your feet. Always pat, never rub! Rubbing will set stains and odors, which is the last thing you want. Remove all liquid pee before starting the next step! Most of our team members swear by baking soda and vinegar. Sprinkle the pee patch with baking soda as soon as you’ve finished removing the liquid urine. Let it sit overnight until completely dry. Then, spray with white distilled vinegar and let that bubble away until it settles. Once the reaction stops, dab up the liquid and then sprinkle some more baking soda. When that’s all dry, just vacuum it up! You can also premix baking soda and vinegar in a spray bottle with a bit of water (2C of vinegar, 2C of water and 4 tablespoons of baking soda is a good ratio). Spray it onto the patch, and let it work its magic. Shake it each time you use it to reactivate the mixture. Having a bottle on hand is perfect for puppies, and a batch should last weeks. Don’t worry about the bubbling baking soda and vinegar! It looks dramatic, but your carpets won’t see any damage. The chemical reaction does wonders to lift stains and odors, though! Vinegar is nature’s best cleaning agent. Baking soda is the best deodorizer you can get. Together, they’re brilliant. We’ve never seen a pee spot this won’t take care of. You can do it for dried urine spots, too. In that case, we usually go with the spray bottle mix approach, or start by spraying vinegar, and then sprinkling baking soda on top. In order to avoid bacterial growth, which causes health problems and the odor you associate with dog urine, use plenty of baking soda. The key is to absorb absolutely all the moisture, and nothing works better than baking soda. Don’t be afraid to pour it right on the carpet. It’ll all vacuum out. Need help finding a capable vacuum for cleaning up after your animals? We’ve got you covered with expert reviews, advice and buying guides. Find links to everything on this site from our homepage! If you don’t want to deal with a multi-step process like baking soda and vinegar, go super simple and spray hydrogen peroxide onto the soiled patch. It’ll bubble like hell, which you might find alarming. Regardless, it disinfects, deodorizes, and takes care of stains just like baking soda and vinegar! You need to spot-test this method, though, since it can cause discoloration on some carpets. If it’s safe on yours, leave it 10-15 minutes, then dab with a paper towel. You might need a few sprays, but it does the trick and doesn’t leave anything toxic behind. If you don’t like the DIY approach, you can buy an enzyme cleaner from the store. These are much safer than chemical solutions, since they use natural enzymes to consume all the organic matter from the urine. You don’t have to worry about any toxic chemicals being left behind or inhaled as fumes. They’ll take care of visual blemishes and odors too. Enzyme cleaners can either be spray bottles or a powder you sprinkle on. Most require 24-hour application, so be aware of that! You can always use a carpet cleaning machine if you have a large area to clean up. They’re expensive to buy, but well worth the investment if you own a home with both pets and carpets! Don’t bother with chemical detergents. A mix of hot water and white vinegar will do just as well! Follow up with a liberal dusting of baking soda, and then simply vacuum it up when it’s dry. Again, get as much up as you can before it dries. Dab with a towel to get the moisture out, and at all costs avoid rubbing. Vomit can be trickier to remove completely than urine, and you don’t want to use as much acid (aka, less vinegar). Sprinkle baking soda onto the patch in question. Then, mix hydrogen peroxide and a bit of dish soap (you want about an 8:1 ratio), and pour that onto the baking soda. If hydrogen peroxide discolors your particular carpeting, mix a 1:4 ratio of vinegar to water, plus a tablespoon each of salt and dish soap. You can spray that directly onto the patch, and then use baking soda after 15 minutes or so. Steam will set the smell and the stain of pee or vomit, so never use it! Chemical cleaners, especially those with bleach or ammonia. They’re highly toxic, and you should never use them in a household with pets. Even if you keep pets away when you’re working with them, they leave residues that are very harmful. Detergents–they’re very appealing, but are actually one of the worst things you can use. You’ll probably want to use some dish soap when you clean up vomit, but you don’t need any to clean up pee. The trouble with detergents is they’re nigh impossible to rinse out without a machine. The residual soap in the carpet fibers then acts like a magnet for dirt. Stick to baking soda and vinegar, or an enzyme cleaner!